You can access the Manage Cases page from the top menu under 'Management>Account> Manage Cases'. This is an administrative function that is only available to the administrators of an account. If you do not see this option and you believe you should have administrative rights to the account, please contact the Account Admin User(s) of your account. The first step in administering an account is to select your account to work on (the left window). If you have only one account to administer you will see only that one account in the drop down window. If you have administrative rights to multiple accounts, you will see the multiple accounts listed. You administer only one account at a time. Once you select an account, you should see the cases you administer within the account on the main table on the right side of the screen. This listing shows the cases associated with the account, the size in MB of each case, and the total users associated with the account. 1,000 MB equals approximately 1 GB of storage. One or more cases can be selected for an action with the check boxes to the left of each case. -It will show one row per month. -It will show the current month as well as the previous 3 months. Note, this feature was recently release and for this reason it will not display the historical data before 09/28/2014. We offer a monthly Flex Plan and Annual Plans depending on your specific needs. If you want to review or switch your current plan, please contact us by phone at 800-401-7809x 22, or by email at sales@ lexbe.com. An option on the left entitled 'Show Columns: Show Users' allows you to include the users associated with each case as well. We bill on the first of a month for the highest of usage for the prior month. Both are tracked on the account usage page. In the example above, the current account usage is 142 GBs and the highest of usage for October is 71 GBs. Any further reductions of usage in the account during October will not impact the October bill, but will reflect on the November bill. Any additions of usage in October will reflect on the November bill, only if it exceeds the highest of usage during October (71 GBs). 1. 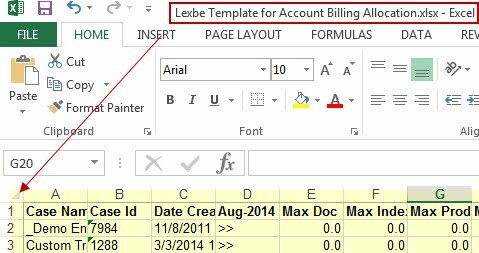 Download the Lexbe Excel template entitled: 'Lexbe Template for Account Billing Allocation' at page bottom. 2. Make a copy and name with your case in the field 'Account Name' (e.g. Lexbe Test). 3. In Lexbe go to the In the Account>Manage Cases page, select all cases and download to Excel. Please save the file locally. 5. Paste into this Excel template on the sheet: Datasheet, in cell A1. Cases and calculation should appear on this sheet. 6. Enter your GB rate (from invoice) in B8 as an integer and then the Dollar allocation will appear in Column 'G'. 7. Billing is based on system storage (GBs) and there are no charges for user fees or case set-up. 8. Billing for the current month is based on the highest usage in the prior month. 9. Storage includes documents, search index, and stored productions and briefcases. 10. Document and case deletions in any month will not affect the next bill, but the following one. 11. Native file uploads will increase on the system after processing, usually doubling, from PDF expansion, and search index creation, OCR and other archive expansion. 12. Calculation may vary for cases that were uploaded under Free Native Load (with 6m hosting) program. To conduct any operations involving users (e.g., add, remove) you must first select the case or cases you want to affect. Until you do this the 'Add User' and 'Remove User' buttons will be grayed out. To obtain functionality, select one or more cases and then the add and remove user functionality will display. You can add an existing user (one that already has access to another case in the account) or a new user to one or more cases in the account. To add an existing user, first select the case or cases you wish to affect, and then choose the existing user from the drop down list on the left. The main table to the right will refresh and the new user associations will be reflected. The Case table, users column will reflect that the selected users have been removed from all cases in the account. If you want to do this action under the 'Management> Account Manage Users' section, please click here. To create a new case, type the new case name to the text box on the left side of the page under 'Create New Case: Case Name'. After adding a new case, you should add user accesses as needed. You will need to add access to yourself if you wish to see the case on your dashboard and want to be able to access it. For more details please go to the Account>Manage Users page. New Users. To add a new user to an account, select 'Create New user in Account', then click 'Add New User' from the left menu and you will be presented with a dialog box to allow you enter the new user email address, customize the email subject, add a personal message, and indicate whether you would like to receive a copy. After you are done, the main table to the right will reflect the new user and an introductory email will be sent to him/her along with login information and the user password. Please note that if a user already has access to Lexbe eDiscovery Platform under the email address you add from another account, then the cases you add the user to will show up on the users dashboard and he or she will have access, but an email will not be sent. If the user has lost or forgotten their login password, he/she should go through the 'recover password' procedure. Then a new password will be emailed to the user (Note: the old password will no longer work). If access problems persist, please contact customer support or submit a ticket. 1. Select the Account (if applicable). 2. Select the case(s) you wish to delete (check-box), this action will highlight the case(s) to be removed from the account. The case name on the upper right of a page is independent from the current account being managed by an Account Administrator. The is no security issue as no one can see information they do not have access to. This is explained in more detail below. c) Create new cases in a selected account and not the account-case you are actually in.